I finished these two cozies in the last couple days. 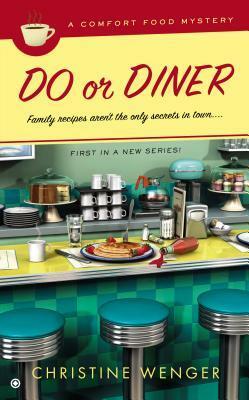 Do or Diner was this month’s group read at the Cozy Mystery Corner on Goodreads. I had seen this before but hadn’t picked it up to read or even put it on my TBR list. I am really glad it was a book club read because I enjoyed reading it, so much so that I already purchased the second book in the series. The protagonist has purchased a family business that includes a diner as it’s mainstay. The rest of the business is focused on summer holiday cottages. The diner specializes in old fashioned type comfort food that sounds delicious. The protagonist, Trixie becomes embroiled in the murder because it happens in the kitchen of her diner and threatens the reputation of the diner. Trixie is not convinced that the local police, who include a possible love interest cowboy cop, are investigating quickly enough to save her business or with enough zeal to clear her name. An interesting selection of supporting characters, including diner kitchen and wait staff and a mayor who comes across as a sleazeball. Well done cozy mystery with a very comforting feel, it reminded me of Connie Archer’s Soup Shop mystery series which I also love. Fat Cat at Large was a book I read about online and was waiting to be released. My local indie bookshop just got it in and let me know so I picked it up on my last trip over there. 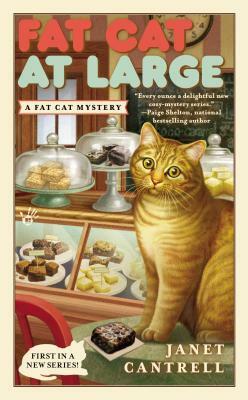 There is a lot to like about this book, Quincy, the fat cat, is an obvious plus, the theme, a bar cookie bakery, and even the setting of Minneapolis, with the cozy bakeshop and Chase’s apartment above it. I also liked the realism shown through the tension between the business partners, Chase and Anna. Often cozies feature best friends, or relatives as business partners in small businesses and show none of the tension or issues that can and usually do arise in those circumstances. As a former accountant, I can tell you that as much as you love someone, going into business with them can often sound the death knell on the relationship. I did enjoy reading this but I feel that it needed to be tightened up a little editing wise and some of the dialogue needs tweaking. It seemed a little off at times. This is the first in the series so I will look forward to the next one to see how it develops. This entry was posted in Book Reviews and tagged autumn, book club, book review, mystery, review. I love your book selection of cozies! They are just theeee best!